We had just finished ripping down the last of the cardboard that was mysteriously nailed all over the ceiling and walls in the garage, when a woman walking her dogs stopped at the front of the driveway. Her name, we found out, was Martha, and she had lived in this house when she was growing up, in the late 1950s and early 1960s. Her grandparents lived next door, and she still lives in the neighborhood a few blocks away. Her father, it turned out, had put up the cardboard, so he could use the garage as a darkroom. He had also put up the fiberglass awnings over the front and back doors and had built some of the fences. This has nothing to do with the house, but it’s what I’ve been up to this weekend. Since 2006, the Flickr photo hosting service has let people identify where their pictures were taken if they want to, and in that time 13,000 people have provided locations for 675,000 pictures taken in the bay area. It turns out that using the Flickr API, you can download a big list of where these pictures were taken, and if you plot all the points, what you get is a map of the places that people decided were interesting enough to visit, photograph, identify, and publish on the web. Popular tourist areas of course stand out, but so do the coastlines, as do the commercial hearts of a lot of neighborhoods. I particularly like that if you zoom in, you can even clearly see the routes that ferries take to and from Alcatraz. In spite of how rich a data set this is, there are still a lot of nearly empty areas on the map. It will be interesting to see if these fill in over the coming years as cameraphones with built-in GPS receivers become even more common. last month when the ceiling lights shorted out we played quite a bit of phone tag with the electrician who rewired the house. because of the timing, it was much easier to “borrow” the contractor who was working on a friend’s attic renovation than to wait for our electrician. however, the electrician did tell us he would be coming this month to finish out his original contract with us by running power to the garage (and hopefully fixing our doorbell). see that back wall? at first glance you might think that is sheetrock (the board propped up against the wall *is* sheetrock)…alas, the material nailed to the wall is cardboard…multiple layers of (in some cases water-damaged) cardboard…on all the walls and the underside of the roof. well, now it’s only on 2 1/2 walls and part of the roof…it got dark too early to finish the job, but eric got the parts removed where the electrical work may eventually be done…we, of course, haven’t heard from the electrician since we cleaned up the garage. cake & pie — oh my! many thanks to erica & brian (the photographer), eric’s parents & brother, brian’s grandparents & cousin, my mother, christia & her eric, and elaine for making eric’s and my first thatbrownhouse thanksgiving such a warm and memorable occasion! It’s been a long time since we had any actual news, but here comes a bunch all at once. 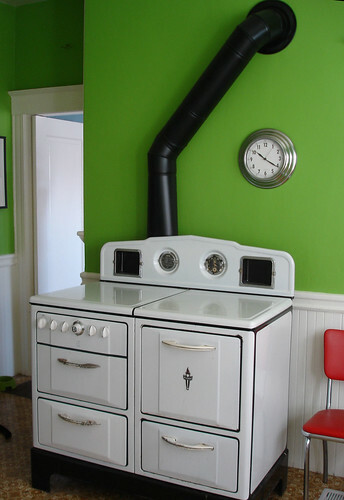 It doesn’t have the charming style of the old stove, but it does have the great advantage of actually working. 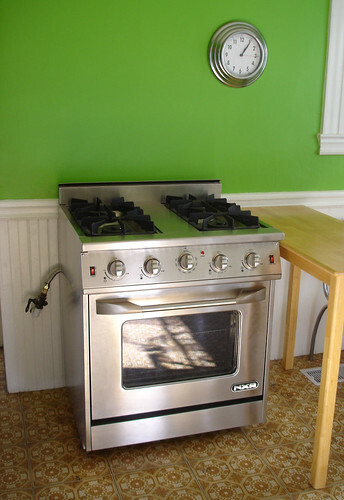 And after the ordeal of trying to get the old stove out the door, it seems in retrospect like it was good to have a plan that didn’t involve trying to get it back in again. Speaking of things actually working, Steph came home one evening to find that none of the ceiling lights worked. Fortunately all the outlets still did, so it wasn’t too bad waiting a few days until an electrician could look into it. After a bunch of investigation, it turned out that one of the wires for the ceiling light in the front bedroom had gone bad and was causing a short. With a new wire, it’s all working again. Meanwhile, the kitchen faucet had developed the alarming habit of squirting water on the wall and window above it every time it was turned on. This was something we were actually able to fix ourselves, fortunately. We took it apart, took out the rotten remains of the rubber O-rings, and replaced them with nice new ones. It still is a little leaky around the edges, but no longer causing mass havoc. And on the cat front, Hobbes the neighbor cat had started following the example of our cats and jumping in our window on a regular basis. He’s a nice cat, but he doesn’t live here. 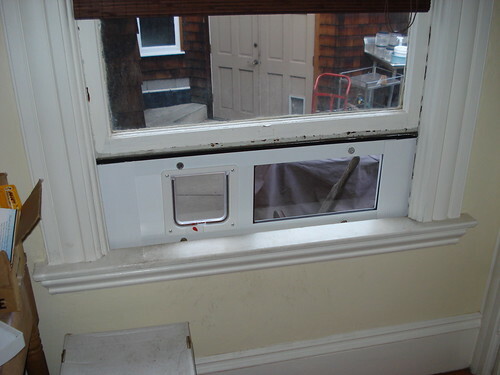 So we shopped around and got a cat door to go in the window, thinking that we could set it so our cats could go out when they wanted to but Hobbes couldn’t come in. But the cats haven’t figured out how to use it! They will sit near it and meow until someone comes and opens it for them instead of figuring out how to do it themselves. Hobbes, meanwhile, does understand how to work it, so if it’s set to allow passage both directions, he still comes in. Sigh. i’d love to be able to gush that the reason we haven’t accomplished any house projects is because we’ve been making fabulous headway toward planning the perfect (memorable! meaningful! pretty! tasty! within our budget!) wedding, but i can’t. we are discouraged. so far our wedding story consists only of drama and disappointment. we have no venue. we have no date. what we do have is plenty of guilt disguised as my mother who has been repeatedly bemoaning her failure as a parent due to our decision not be married in the episcopal church. on the home front, several folks have requested more photos of “finished” projects and rooms, so i’ll try to do an odds and ends post with photos this weekend. steph (standing amidst the post-party dirty dishes): do you realize that we got the house (with the exception of the “office”) all cleaned up and presentable, made a mountain of food, strung little white lights outside, and then had almost 50 people over and didn’t take a single picture? eric: we were having too much fun. steph: but i promised photos to the people who read the blog! so, we think the party was a success. we got to see some folks we hadn’t seen in awhile, including some friends who were visiting from portland, eat a decadent birthday cake prepared by christia, and *big grin* announce our engagement without usurping somebody else’s party to do so! yup, we’re getting married! squeeee! it’s been a very busy crazy year for us, so it may take us some time to decide when, where and how we want to “make it official” but we’re definitely going to host a celebration…and we’ll probably even blog about the preparations! that you are tired of visiting us only to keep seeing the ants in our cupboard…and we do want you to keep visiting us…but we are wholly unmotivated to finish unpacking, let alone start another house project (or finish the ones we’ve managed to forget that we are in the middle of). therefore, we obviously need to throw a party. on august 16th. if you would like to come , but did not get an invitation, you can e-mail us at thatbrownhouse at yahoo dot com to request the details. yes, yes, we will take some new photos before/during/after. in the meantime we should probably shuffle around the furniture a few more times, grumble about having too much stuff, put the doors back on the cabinets, etc. ant, ant, ant, can’t deal with any more ants. we are overrun with ants (but not the fun kind that tell you all the family gossip) and it’s making our whole household cranky…especially eric, who is typically very even-tempered. they are coming in through joint between the window header and the wall in the dining room, then tracing their way across the dining room wall, through the china cabinet, across the kitchen wall and counter and then either behind the stove or into the sink. in the sink they are then disappearing into a groutless tile grout joint. gah! we sprayed cedar oil all over the place last night, killing scores of them, but i think they must have a nest in the walls or something. gah! gah! gah! oh no, not another home renovation blog! "that brown house" is a circa 1910 brown-shingle, arts & crafts bungalow in oakland, california. this blog is about eric & steph's adventures as first-time homeowners restoring, renovating, and remodeling our wonderful, if quirky, new home.